John and George were great they made the class fun. I could not have done this without Mike Holt's Program. I really appreciate the support of you guys and I’d like to thank instructors John and George for the excellent presentation they did for all of us...Awesome. The most important thing we learned was how to take the test. The office staff maintained communication with me from day 1. Most important was the understanding of how all the books were written and organized to quickly find the area where the answer will be. Everything was done at a top notch level. I think the presenter John, did an exceptional job of keeping the lectures interesting. The office staff was easy to work with and were as friendly as could be. Got a 99% on both tests first try! I really liked the way he (John) controlled the class. He presented it in a great manner. The most important thing I gained was confidence and test taking skills. Mr. Mills was very good at confidence building, book organizing and comic relief. The office experience was excellent. The representative who answered the phone was very kind and encouraging. I took the business exam 5 days after the class and passed on first take? I take the technical on 3/19, and I feel really confident. I would definitely recommend this course to anyone wanting to get their license. The presentation was excellent! The practice exams and the highlighting of books were very helpful. The information presented was up-to-date and current with the test. John was very personable. He answered all questions that were asked. His hands-on field experience was very helpful. He explained things clearly. The office experience was excellent. Ilene was extraordinary! I enjoyed the class and I will attend future Mike Holt presentations. John is the best instructor I've ever had in my 20 year career. Extremely knowledgeable and dedicated to each individual student's needs. The office experience was excellent!! The home study material was perfect. The most important thing I learned was how to read the questions and prepare for the test. I liked the recommendations on how to take the test and what to expect. The instructor was very accommodating, went above and beyond, did not rush and was very patient. The office personnel were very professional. I think the home study material was very helpful to prepare for class. The most important thing we learned was to stay organized, prepared and focused. Mr. John is the man. He is understanding, helpful, very knowledgeable and especially motivating with taking the test and other aspects in life. The office experience was great. The most important things learned were test taking skills and navigating the NEC. John is a great teacher. The way he manages the class and educates you really makes the information stick. The office personnel were very helpful. The home study material makes something very complex easy to understand. Great over-all experience. My dad took this course after his first attempt for his license failed, and then passed, This was my first time taking this course and I passed my test the first time. My brother will be going to your class when he gets ready to take the test. I can't be more happy with my experience with this class as well as the networking. The most important thing I learned was how to analyze the question and relate it to what book the answer is in. The exam prep seminar focused on passing the exam. Don't overthink the process. Follow the process and you will pass. John did great with applying real world scenarios and relating them on how to prepare for and take the test. Every time I call for support, I get great customer service! I appreciate the fact that you value your customers. The most important thing I learned was how to use the other Code reference books and contractor's manual that are not used much as a Journeyman. I think that the class was close to flawless. John explained things so well that even someone that wasn't an electrician would have been able to understand. He showed us that the exam was not difficult if you paid attention to how to use the Code books. He did a very good presentation. Better than some of the monotone speakers that I have heard. He made sure that everyone understood the subject before proceeding. Everyone that I spoke to at the office was very helpful and had a positive attitude about the material. The DVD's were very helpful. Mike does a very good job with the subject material. I have already recommended this class to other electricians. I told them that it would make continuing their careers much easier. This class was instrumental to my success on the state exam. It provided techniques and proven methods on how to use the books. John was very knowledgeable and enthusiastic. Although the class was long hours it did not seem that way because of John's excitement. The most important thing I learned was how to actually take the exam. Also, how to highlight and navigate through all of the reference books. The class is fantastic. John covered everything that I saw on my exam. John is hands down the best instructor. He obviously knows his stuff! Your office really cares about your students. The home study has a ton of useful information and really made me confident going into the class and ultimately my exams. Thank you Mike Holt Enterprises! I couldn't recommend your products any higher. Thanks to your Florida Electrical Contractor Exam Prep Class, I passed both of my exams on my first attempt! If you are taking the Electrical Contractor exams, you cannot afford to miss this class. Thanks again. The most important thing I learned was how to assess the test and pace myself. John was a pleasure, he kept us all awake and engaged. The office experience was exceptional, everyone is on board and looking out for our best interests. It was easy to understand and thorough. Comprehensive, good reputation, Christian based. The most important thing I learned was how to prepare for the structure of the exam and navigate the books. ​You helped eliminate any mystery or intimidating elements of taking the exam. The team did an amazing job of making me feel prepared for the exam. I’ve taken both exams (Alarm 1 and Business) and passed each on the first try. I can’t tell you how helpful the class was in preparing me and providing confidence in taking the exam. The class was excellent. The instructor was knowledgeable and knew when to insert a joke to keep the class awake. The most important thing I learned was how to manage my time and take advantage of every minute available during the test. Also, what not to do during the test. The idea of taking tests the first day was brilliant because it set the tone for the rest of the class. John is one of the best instructors I have taken a class with. He was professional and had great control of the class and the material. The videos and books really helped me refresh my knowledge. They are concise and provide an abundant amount of information. I came into the class feeling, what I considered to be, very unprepared. I ended the class feeling prepared and passed both tests. John, the instructor, was great. His experience with the information, and years of teaching, made the class informative and pleasurable. I have never had a bad experience with Mike Holt. Hands down the best company I’ve come across for exam prep. I had an ER license and wanted to get my EC. Having taken a similar test for the ER, I just got the home study package. It was absolutely brilliant! I’ve been doing this for many years and thought I was reasonably sound as far as knowledge goes. But I would say the DVD package takes it to a whole other level. I particularly found the DVDs on Grounding and Bonding to be absolutely brilliant and a must watch for any electrician. This course is brilliant for exam preparation, but it’s so much more. It provides a new knowledge of fundamentals that no other course provides. I feel it’s a must for any electrical contractor regardless of whether you're taking a test. With Mike's package, I was able to pass my Unlimited EC license on the first try. Can’t thank Mike and his team enough. I would highly recommend this company. Mike Holt's exam prep program is the best. I have taken other exam prep courses, none of which can compare to this course. I completed all of the study material before the class. The parts I had trouble with or didn't feel confident about, John, my instructor, broke it down and made it easy. I took my Unlimited Electrical Contractor's exams the following two days after the class, Thursday for the business, and Friday the technical. I passed both sections the first time with plenty of time to spare. For this I want to thank the Mike Holt team and John for helping me along this journey. I give this course a 10 out of 10. John covered everything needed to be ready for the exam and how to take the exam. I don’t think there is anything I would change about the class or the way it was structured. The material is everything you need and then some. The home study is perfect, just what is needed. John is very knowledgeable and one of the smartest instructors I have had. Anytime I would speak or email the office of Mike Holt, his staff were nothing but top notch and helpful. Always polite and genuinely wanting to help in anyway possible. For this, I highly recommend Mike Holt’s program and team to anyone. I am looking forward to completing my continuing education through Mike Holt. Thank you again for everything. You guys do an amazing job. John is the best instructor EVER!!!!! The program could not have been any better, keep doing what you are doing. From the home study package to the class, everything was perfect. The home study material was perfect for preparing to take the exam. The most important thing I learned was how to confidently pass my Unlimited exam the first time. Questions on the practice tests were some of the same questions I had on my Unlimited Exam. I took my exam the day after class ended. I passed both the Business and Unlimited exams. I could not thank you and the entire Mike Holt team enough. Everyone at Mike Holt Enterprises was with me every step of the way. I could not have passed this exam without them. It was a great review class. John helped get everyone prepared for their exam and how to take it..Great teacher! It was everything I needed to pass my exam. Everyone I talked with was very helpful! I just want to say thank you. I passed my Alarm II on my first try. The classes were great and very helpful. John kept us focused and entertained. I was never bored during the whole week….. Thank you everybody. God bless you all. It was worth it….. I took the class this past week.with John Mills teaching. I passed both the business and technical on the first try. I think that is worth a 5-Star rating! Thanks a bunch John!!! Without your class it would have been so tough. I finished the business 1 hour early and finished the technical 2.5 hours early!! I scored a 99% on both. Mike Holt and John Mills and team are great and worth the time and money. See you for the next license. The organization helped me pass my EC and Plans Examiner exams. The service I have received has been great. Thank you Mike for the great programs and study materials. Thank you so much , There are no words to express my gratitude. John was funny and very good at communicating what he was teaching. I took both tests and passed both the first time. Thank you for all your help. It was a pleasure to meet you Mike. Thank you for taking the time to speak with us. The class was a 10 because of all the knowledge I received and the level of comfort with the instructor, John. He makes the class interesting and gives the right breaks during class. The class was spot on. The business section of the class was great. It is one of my weakest spots because I use accountants, payroll companies, etc. The class moved at the right pace, A lot of info in a short time. Friday to Wednesday worked great for me. Both instructors were very good. They went over the info and explained what to expect during the test. The home study material is great. The class was awesome, very informative and John is the best instructor I have ever known, he cares about his students very much. He is funny, very knowledgeable and very easy to work with. I was one of two guys that stayed until the end every night, even past 10 pm and John was with us until we had no more questions to ask for the day/night. He cares! He’s an awesome dude! Also, it was very cool to meet Mike and to listen to his encouragements. The confidence in taking the exams that John gives you is top notch. It was good material, very helpful and easy to understand and use. Keep John and George for a long time, they are a super team out on the field. I am very happy to let you know that I passed both my Business exam as well as the Technical. YEAHH!! - Thank YOU GOD and you guys for your help and support. God bless you guys and please keep doing this awesome work. The instructor, John, was great, informative and enjoyable. He took the time with all students to make sure they understood the material. Very easy to deal with and all of the material was very informative. I was extremely happy with your class. The live class was great. I passed my exams with ease and only took ½ the allotted time needed on each one. I was the first one done on both tests and knew that I passed with no concerns. John was a GREAT instructor. I could not have asked for a better one. It is nice to see his confidence and it gave me the confidence to do great on my tests. I think I answered 70% of the questions on both exams before I opened the first book. He gave us all the tools needed to pass with ease. I got a 99 on both exams. The home-study material was helpful in getting me ready for class. The program was great. It was good to see that Mike took the time out of his busy schedule to stop by and see the class. Very professional. John, our instructor, was entertaining as well as informative. I loved him! He taught us what we needed to be successful. Everyone at the office was helpful and friendly every time I talked to them. I passed both parts of the exam the first time. There was a great overview of information and formulas needed to take the Florida test and great test taking skills to confidently take the test. The teacher, John, was very informative with all aspects of this test and what would be on it. The class was formal but informal at the same time (does that make sense?). You didn't feel like you were GLUED to the chair and could take a break if you needed to, whenever you needed to (which wasn't very often as you were afraid to miss something important)! YOU NEED THIS CLASS TO PASS THE TEST SUCCESSFULLY AND WITH CONFIDENCE!! All prep material was shipped immediately and you know EXACTLY what to bring to class. Books were easy to acquire and you gave us all the info to obtain them. Reminder emails were great to prepare you and give you vital information. Just wanted to let you know how appreciative I am to you guys (especially John) for the services you provide! I took your Florida Electrical Contractors Seminar from June 24th - June 29th in Orlando. It was a LONG week and frustrating sometimes because of how much information there was to go over. Those tests were BRUTAL! John was GREAT. He explained all Business and Technical aspects of the test to us as well as the mathematical formulas we would need to remember. He not only went over the information that could be on the test but HOW to take the test and succeed. Your seminar gave me the confidence to calmly take these tests without panicking or getting frustrated. He drilled things in our mind that I still remember and will for years to come. I took my tests on July 12th (Business) and the 18th (Technical) locally here in Texas. Please relay to him that I passed them both with a 99.9!! Again, thank you guys so much as I COULD NOT HAVE DONE IT WITHOUT YOU!!! YOU GUYS ARE THE BEST!! Just finished the State Electrical Class yesterday and passed both sections of the Florida Unlimited Electrical License today. John Mills is an amazing instructor and I wanted to personally say thank you. I will recommend this class to anyone wanting to pursue a license. I started in the electrical trade roughly 25 years ago. Throughout those years, I constantly heard of Mike Holt and of the success rate of the students after taking his course. I honestly didn't believe that the pass rate could be so high, but I took the chance and enrolled for the Unlimited Electrical Contractor’s course. When I took the exam, I was fully prepared for both the EC and Business portions. I passed both with flying colors and I had plenty of time to review each and every question before I submitted my answers. I have kept in touch with a few of the guys that I met while taking the course, they all passed as well. One of the greatest joys in my life was to hand my father (a master electrician too) my test results and seeing him fill with pride. Thank you, Mike, for putting together such a great and skilled team that made my dream possible. I broke ground in Florida as an electrical contractor, June 22 2015, wiring a Love's Travel Stop. I AM PROUD TO SAY THAT MIKE HOLT'S TRAINING CLASSES HELPED IN MAKING THAT HAPPEN. Just like to express my thanks to your whole team. Like I mentioned already, it was a pleasure to meet Mike. The class was great, and I can’t say enough about John. Outstanding job by everyone at Mike Holt. I passed both tests last week and I am now working my way through the application process with Jackie at API Processing. Thank you! You were right the classes were intense. John did a GREAT job. I am so thankful that I took the class. I have taken license tests before but none were as tough as these in Florida. I passed the technical yesterday and the business test today. Praise God! After a long weekend in Orlando taking The Unlimited State Prep Class ... not only did I pass the Business exam on the first try, but the Unlimited Exam seemed so easy. Passed it with 99%. Thanks to John & George for making it understandable. Anyone who needs to take the exam should take their training class if they want to pass on the first try. Today I took my Business Exam and got a score of 99. If it wasn’t for John and George and of course Mike Holt for offering the classes, I don’t think that I could have done as well. A special thanks to you guys for all the work and effort you put in supporting us future contractors. Thank you for your assistance with straightening out my exam.I am very happy to say that I passed both. John and George were great and the system works well. Please send your dad a special thanks for stopping by on Sunday. John did a great job on covering HOW to take the test. The highlights and short cuts on difficult questions came in handy. I passed the business test on the first attempt and the technical test on the second attempt. This has been a long time personal goal of mine and the Mike Holt system works if you buy in. Thanks John Mills and The Mike Holt Family. The quality of the training material in the Florida Unlimited Electrical Contractor Program has been terrific and just continues to get better. I love the fact that Mike always credits and gives thanks to God. The Florida Exam Prep Class provided the tools required to take the Exams. I learned how to efficiently find information in the reference books. Mr. Mills had the knowledge and skills required to teach the Exam Prep Class. He was available and willing to help with any and all questions. The home study material was good. I am pleased to let you know that I passed my Business and Technical Exams on the first try! The Mike Holt Exam Prep Class really helped me understand what to expect from the exam and how to be organized and prepared. The Florida Exam Prep Class gave me the tools and knowledge to PASS both the Business and 5 1/2 hour technical Exams the 1st time!! John is GREAT, he is an AWESOME instructor! I would take another class with him being the instructor without a doubt. All in all, I would recommend this class and study material to anyone taking these exams. The overall experience was very good. Thank you for helping me PASS both Exams. I passed. I was prepared for almost every question that was asked on the test. John’s style of teaching is inspiring, motivates you beyond this one test, it wouldn't be the same without him. I use the material for work, it is a great reference. I will recommend you to everyone. Thanks to John Mills and his methods for testing, time management and skill in all aspects of Electrical Contractor testing. I passed both parts of my Unlimited Electrical Contractor Exam Monday and Tuesday, thanks again.. I want to thank you for the great job you did preparing me for the Unlimited Electrical exam. I followed all of your advice and feel that the class was well worth the time and cost. It was a very tough exam and I did have to take it twice, but all of the information that was presented was relevant and very useful and ultimately got me a 99 on the exam. I would highly recommend this prep class for anyone taking the Florida Electrical Exam. John, I want to thank you for the great job you did preparing me for the unlimited exam. I followed all of your advice and feel that class was well worth the time and cost. It was a very tough exam and I did have to take it twice but all the information that was presented was relevant and very useful and ultimately got me a 99 on the exam. I would highly recommend this prep class for anyone taking the Florida Electrical exam. Have a Great Day! I just wanted to take a second to thank you and the program you guys have. With your help I passed the business with a 96 percent and the state unlimited with a 98 percent on the first try. Thank you guys - couldn't have done it without you all. I used the combination of the master study guide and the class that was taught by John Mills, who by the way did an awesome job and has a great way of teaching. Passed both the Business and Technical section of my Florida Unlimited test on the first try. I couldn't have done it without the help of your crew, Mike. I tip my hat and say thanks and will definitely be seeing you guys again in my continuing education. Mike and Team, I would like to let you know that your FL Electrical Contractors Test Material is great tool to use as you prepare for the exam. I have successfully passed both the business and technical portions of the test. The material is easy to follow and grasp. While working hand in hand with the study guides and code book, it has taught me how to use NFPA 70 better. John was great. Super funny and super educational. I couldn’t imagine taking a class like this with an instructor with no personality. He was a perfect fit to teach a bunch of rough-tough tradesman. I passed both tests first try, and I’ve only been trying to get my license for about 2 months. Without the course, I wouldn’t have stood a chance. Thanks. I can not emphasize enough how amazing this class was. With the class and the home study material I had no problems in passing my unlimited electrical contracting tests. Thank you!! The material was exactly what I needed. The most important thing I learned was how to use all of my books in order to take the test. John was amazing and is a top notch instructor. The only complaint was how cold he made it in there but I know it was to keep us awake!!! Again thank you to everyone on the Mike Holt Team for everything you have done. I look forward to the CEU seminar this summer. This course is a 9.5! The content was appropriate and relevant, and John is an awesome instructor. I passed both tests no problem! The Florida Contractor exam prepation course is a10 all the way. Everything about the course was excellent, including the space where the course was held. The most important thing I learned was all the tricks we were armed with for making simple calculations, things that I normally have put to memory were made simpler with these tools; i.e..”Easy as PIE”. The course content was appropriate and relevant. The instructor, John, is amazing, engaging, interesting, never lost energy, never slowed down. For classes this long, that attitude was absolutely necessary. I passed both my exams as of today and for that I thank you. In making the decision to take the test I turned to you guys. I was initially nervous about the course and test. I would rate the course a 99(John will understand). The most important thing that I took for the course was the ability to find answers to questions in the material provided. The disappointment about the class had to be the fire alarm going off at 430 in the morning on the first night, other than that no disappointments! During the test I felt completely confident about where to go and what to look for. That was due to the material being relevant during the class. John Mills was a great instructor. He gave a great deal of information in a short amount of time, you had to keep up. I would recommend this course to anyone that is preparing for their electrical exam. This Florida State Class was a 10. I learned to pass this exam by focusing on what information is vital from the numerous textbooks. John is a very good instructor and kept the class fun and engaged. George was also a nice addition to John's performance. I passed my Electrical Business and Law the very next day, on Thursday 3/5; I passed my Electrical Unlimited that Friday 3/6. Both of these exams were my first attempt. The class was AMAZING! I was one of two girls in a class full of guys, so that was a little intimidating but John and George are so inclusive that I never gave it a second thought after the morning on the first day of class. John's knowledge and ability to teach and capture our attention for hours at a time was absolutely incredible. I also did a couple months of studying with the DVDs and workbooks which made it a lot easier to understand what was being taught in the class. It was also very helpful to already have my books tabbed and highlighted.The expanded table of contents for the NEC book was a complete LIFESAVER during my testing. It is so worth the $20 and made finding answers quickly to some very obscure questions on my test. I took the business portion Friday and the technical yesterday (Saturday). I was told by quite a few of my friends and business associates that I should expect to not pass the first time as they had never heard of anyone passing the exams the first time. Well I went into the tests feeling confident and very well prepared. Business took me an hour and 45 minutes, including the 15 minutes for the practice review and reviewing each answer thoroughly. I passed. Technical took me almost 5 hours and was very tough. I literally tally marked on my scratch paper only the questions I knew I had absolutely correct just to make sure I had 75 solidly answered. LOL. Oh my word! When I got to the counter, I turned the page over to see PASS!!! I was soo stoked and proud to tell all those naysayers, that yah, I passed both the first time!! I have already hired Dawn and her team at API and to help me complete the necessary paperwork to be ready for the next Board of review in May to finish up the license. The most important thing I learned was was to expect on the test...getting an idea of how much I can anticipate seeing from each of the reference books. John was awesome. He made it easy to stay focused and actually absorb the material. John is the best instructor I have ever had. He teaches everything you need to know for the test, he has that good moral character, he is a fun guy, he would make up a song, a phrase, even a dance to make you memorize stuff. The classes were very professional, easy to understand, and the schedule was performed in a timely manner. This course is a 10! I took both of my exams December 17th, a week after classes. I took business at 8am and passed, and the same day took technical at 3pm and passed. I was so confident going through the whole exam. I have and would recommend this class to everyone that wants to pass their exam the first time. Thanks John Mills, George Cancio and Mike Holt. The most important thing was the review of several things I have not seen since my apprenticeship (30 years ago). While I am confident that I could have muddled my way through a review was very helpful as these were important to passing the exam. John did an excellent job. He is clearly qualified to teach this class and I learned a great deal from him. I currently hold license in 10 states with Florida soon to become number 11. Sarina & All Thank you to everybody there at Mike Holt for your help, especially John Mills my instructor. I am not a good test taker so I signed up for the class before testing last Wednesday. Thursday I tested Business a 2.5 hour test; after going thru the questions 3 times, 1.5 hours in to it I felt I had done my best - and passed. Wednesday a week later I tested technical a 5.5 hour test; again after going thru the questions 3 times, 2 hours in to it I felt I had done my best - and passed. I would not have made it with out the class. Thank you, Richard Longo Jr. The class was a 10. The best thing was to learn which book to refer to given a particular question. John was great. Very knowledgeable and he kept your attention during the long class hours by interjecting jokes quite often. He basically didn't waste any time, but told you EXACTLY what you needed to know. Nothing more, nothing less. Great Job! Thanks, Erik Figueredo PS. By the way Sarina, I passed both exams! :-) Thank you for your help as well. Hi Sarina- I would rate the course a 10. I think John does a great job of preparing you for the test The most important things I learned last week in the class were concerning the business items. Even though I am involved with the "business" every day there are things covered in your class that we don't see much. John also did a good job of keeping you confident that you WILL pass this test No disappointments-content was great-probably covered 90% of the material I saw on my test I thought the class was very good and I would recommend it to all who are preparing to take the test I passed both tests last week Thank you, Tad Godfrey Godfrey Electric, Inc.
Sarina, I thought that the class was very well put together. John did a great job of showing us all of the material that was on the test. By the way John, I got a 99 on both the business and technical. Thanks for all of your help. Brian M.
The class was great I rate it a #10 John was a great instructor, I learned a lot in a short time. Best Regards, Aaron Rayburn Vice President Flash Electric of Central FL, Inc. I would definitely recommend this course to anyone taking the exam. The information was about everything we needed to be aware of. John, kept the class moving and broke the tension to keep everyone focused. Austen electric Inc. Richard Curry V.P. 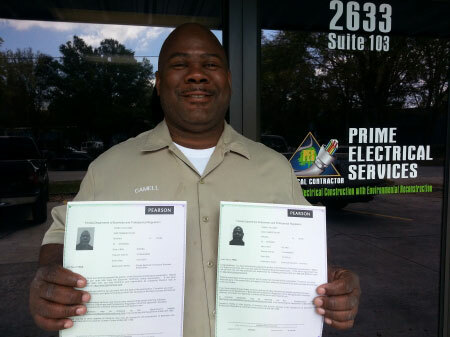 Hi Sarina, I just wanted to follow up with you to let you know that my husband Chad Ward who attended the Electrical Class in Orlando earlier this month before the exam and he PASSED his ES Sign Specialty test. We just want to say THANK YOU! THANK YOU! THANK YOU! He took a course at another school last year and my husband was so frustrated that they could not teach him how to do the calculation problems and that was the only part of the exam he had issues with. He took their class 3 times in 2007 before each of the Electrical exams and could not pass the test. He took the Mike Holt class ONCE in 2008 and passed. GREAT JOB! Andrea Ward Sign FX, Inc. The Sarina / John / George / Mike Holt experience has definitely been very positive. Thanks to all very much for your dedication to the learning process and the Electrical industry. John understands what he is teaching, and very professional in his delivery. Lloyd Welborn / ARS electrical, Charleston S.C.
Sarina, I could not have passed without the help of Mike Holt Enterprises. A sincere thank you to everyone. Jon Chatelain Jon C. Chatelain Jr. Operations/Project Manager Service Communications Inc.
Sarina: Just wanted to let you know that John and George, your instructors for HELL week, were fantastic. John made what could have been an excrutiating week bearable and informative and always kept the classes interesting and funny. They are both very knowledgeable and I enjoyed being in their company for the week. I have passed the business portion of the exam and am still awaiting the results from the technical test. Whatever I scored I believe their help was tantamount to being able to take the test with some degree of confidence. Being a licensed electrical contractor in NJ for 20 years, I forgot, how much I forgot in respect to the code and calculations. Whatever the outcome of the technical test I was totally satisfied with the instruction and believe the money was well spent if you are serious about attaining a state license. I will advise you on the outcome of my test on receipt of notification from the state. Thank you for all your help. Pat Ruccio A.L.M. Electric Co., Inc.
Dear Mike, I am writing this letter to say �Thanks�. I have been using your products since 2000, when I purchased your complete library. It is now 2006 and I hold approximately 10 Masters Licenses in NY and the outlying areas, including Connecticut State, and now most likely Florida State Certified Unlimited Electrical. I sat for the exam yesterday after completing your 6-day prep course with John and George. The class and the instructors were great, and even though I don�t officially know if I passed, I think I �KILLED� that exam. I am taking Rockland County (the last county in NY that I don�t have) next Friday and New Jersey in July. Needless to say I have complete confidence for these upcoming exams. I couldn�t have done it without your help. Thanks again for everything, Rob Robert Biscardi Sun Electric Works, Inc.
Hi Sarina - I am just getting home after a very long day, but did not want to go to bed without telling you how much I appreciate all the time you gave me in your office today. How grateful am I that I stopped by to pick up books rather than have them mailed? Very!!! I felt like I had won the lottery when you began giving me resources and telling me stories. I can not thank you enough for all you did today! Really, I just felt like I was in the office of an "Angel". George and I will talk again in the morning and then I will contact Marie. I will let you know how it all turns out. You guys ROCK at Mike Holt! Shannon Frost Frost & Company, Inc.
Sarina: Thanks again for everything. It took some time but after speaking to ten different people the state has finally fixed their mistake. My application was approved in June yet some how I was removed from the list. No one in the state seems to understand how it happened. I have my thoughts. Any way, they finally contacted me yesterday and not only mailed the admission slip, they faxed me copy in case anything should go wrong. Again, thank you so much for your help and supplying me the proper number and person to call to get this issue straightened out. My application to the ADA was also accepted and I am getting 2.5 more hours and a private room to take the test. What a deal. Guess being handicapped has its privileges. You have been a great help and I thank you again for being more than just a business. You definitely have proved that your companies objective is to fully assist the applicants and not just fill a class. Gary Dubnicek President Blue Chip USA Inc.
Sarina, Just wanted to let you know that I passed. Just found out today!!!!!!!!!!!!!! Thank you very much for everything you and the entire team did for me. Thanks again Kevin Kilbourne Vice-president James W. Knight Electric, Inc. I would like to begin with saying, DUDE, Thanks for selling me the watch. (I even looked at it during the test). As you may know by now I did pass. (I think I scored a 99). I would like to thank both of you for your help. I did learn a lot in the class and had a good time doing it. Your teaching technique along with George’s support made the difference. The preparation and information you shared was great. Thanks again Joe Kelly Service Manager Edd Helms Group, Inc.
Sarina, I would like to let you know that the two instructors, John and George were more than teachers they were perfect banks of knowledge. They were two of the best professors I’ve had in all the years of schooling I’ve had, which I’ve had plenty. Thank you for having them on your team, I will recommend your course with them to all I meet that are in need. Sincerely, Cyrus Brush CEO Coast Guard Security LLC.